The Cleveland symphony suspended Preucil back in July, when a female violinist named Zeneba Bowers accused him, in the Washington Post, of misconduct that took place during a lesson with him in Miami in 1998. Within days of Bowers' accusation, Preucil resigned from his teaching position at CIM. The Cleveland Orchestra told NPR that it would not comment on any accusations until its ongoing investigation is complete — when, a spokesperson says, it will share "key findings." Mettenbrink told the Cleveland newspaper that reading Bowers' accusations led her to make her own allegations public. "I started shaking, because it was so similar to my experience," the Plain Dealer quotes her as saying. Like Bowers, Mettenbrink was also a member of the New World Symphony (NWS), a training orchestra for players who are just emerging into their professional careers. Like Bowers, Mettenbrink says that her incident took place in a hotel room in Miami in 2005, where Preucil was staying while giving master classes and lessons at NWS. Mettenbrink was 26 at the time of the alleged incident. Mettenbrink told the Plain Dealer that she had already taken one lesson with Preucil without incident; he offered her a second lesson at his hotel, saying that there was no availability at NWS. She alleged to the Cleveland paper that when it came time for her to leave after the lesson, he asked about some jewelry she was wearing, invited her to sit down, then seized her and "stuck his tongue down my throat," she said. She told the paper that she broke free of his grasp, grabbed her instrument and ran into an elevator. 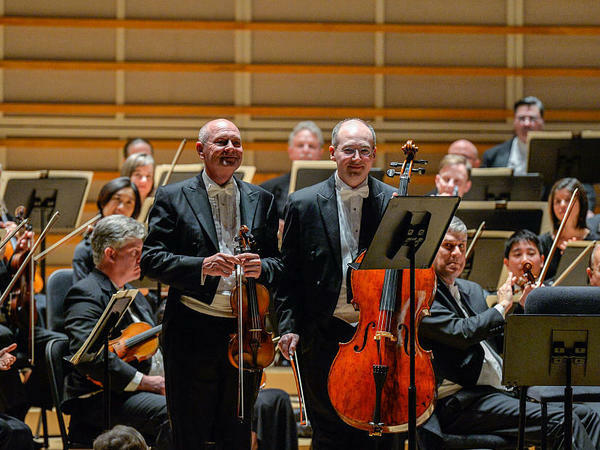 Mittenbrink said that she confided in a fellow orchestra member afterwards, who urged her to report the episode to NWS management — but, according to the Plain Dealer, "the symphony's personnel manager was unsure how to proceed." Days later, she said, the orchestra suggested that she contact Preucil by phone, which she declined. NWS did not respond to a request for comment from NPR. Mettenbrink said that the alleged incident destroyed her confidence and that she made a point of passing up certain opportunities for career advancement, such as job openings at the Cleveland Orchestra, in order to avoid crossing paths with Preucil. She is currently a substitute violinist with the Minnesota Opera. Raffaela Kalmar told the Plain Dealer that she was a 19-year-old freshman at CIM in the spring of 2003 and studying with Preucil when he allegedly harassed her at the beginning of a lesson. She told the paper that she looked down after unpacking her violin, and realized that Preucil was lying on the ground between her legs, looking up her skirt. She said to the newspaper that he told her, "I just want to see what's up there." She also told the Cleveland newspaper that she had been warned by other students to be careful of Preucil. But, she said, she decided to continue studying with him after the alleged incident, due to his reputation as a teacher, and that nothing similar transpired for the remainder of her time at the school. Still, she said, she was continually worried. According to her official biography, Kalmar began her studies at age 5 with Preucil's mother, Doris Preucil, in Iowa City. A violinist with the Pacific Northwest Ballet in Seattle, Washington, she is also married to Carlos Kalmar, music director of the Oregon Symphony and principal conductor of Chicago's Grant Park Music Festival. The Plain Dealer reports that Preucil has not responded to Mettenbrink and Kalmar's allegations. Attempts by NPR to contact Preucil since the Post first published Bowers allegations in July have not been successful.